Artist Barbara Robertson is the current artist in residence at Oxbow gallery, which offers a stipend to artists and is one of the latest and most flexible spaces for developing new works of art in Seattle. Grasping a projector, artist Barbara Robertson walks around the Oxbow gallery in Georgetown, trying out different locations to project her latest video. As she tilts the machine, her mesmerizing, architectural animations illuminate a smooth white wall, slide across a window and corner and activate the floor. Robertson’s frequent collaborator, the sound designer Johanna Melamed, offers feedback, along with Oxbow’s program manager and co-owner, Ruth Lockwood. It’s all part of the process of showing art at the Oxbow, one of the latest and most flexible spaces for developing new works of art, particularly site-specific installations, in Seattle. Rather than following the commercial model of traditional galleries, where galleries get a commission for any artwork sold and artists get paid only if their artwork sells, the Oxbow offers multimonth residencies with no-strings-attached financial and logistical support. 4-7 p.m. Thursdays-Saturdays through Jan. 6, Oxbow, 6118 12th Ave. S., Seattle (check website for holiday hours: oxbowseattle.com). 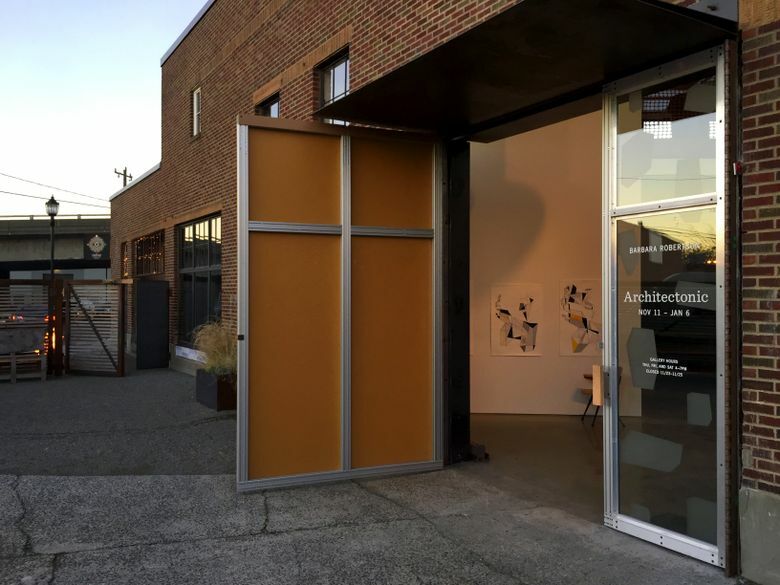 That kind of support is unusual, though not unheard of, in Seattle, with MadArt and Gallery 4Culture as other examples of noncommercial galleries that foster the creation and display of new work. Ample space to explore ideas is also valuable for artists who often find it difficult to afford studios in a city with sky-high real estate and rental costs. The Oxbow came about when Ruth Lockwood, her husband, Tony Lockwood, and Marcus Crider — who together operate design/build company Lockwood & Sons — partnered with Gabe Kean of exhibit-design firm Belle & Wissell, Co., to purchase and remodel a large property in Georgetown in 2012. The three brickfaced historical buildings once housed a home-heating fuel company, a Ford car dealership and service shop, and, most recently, the Alaskan fishing company SnoPac. The new owners renamed the property as a nod to the history of Georgetown’s center, which was once a small township called Oxbow, tucked into a bend of the surrounding Duwamish River, and spent most of the next four years building out the space. A fabrication room occupies the back and other creative and administrative spaces are tucked in here and there. A gravel courtyard in front connects the Oxbow with eat/drink establishments on either side: Ciudad and Bar Ciudad. The owners turned the heart of the building into a lofty, industrial-chic space with enormous potential. The loose plan was to rent it out for events, which would generate funding for art shows. When artist Mary Ann Peters approached them in 2016 about creating a site-specific work over the span of two months, everything clicked: They would host creative residencies, allowing artists to develop and exhibit new work. Artists are given a stipend, about $1,500, derived from the event-rental income, and there’s no pressure to sell work (although artists can choose to do so). The Oxbow is open to the public throughout the residencies. After Mary Ann Peters’ initial project, residencies were granted to Saul Becker, Michelle de la Vega, Dan Webb and Chris McMullen. 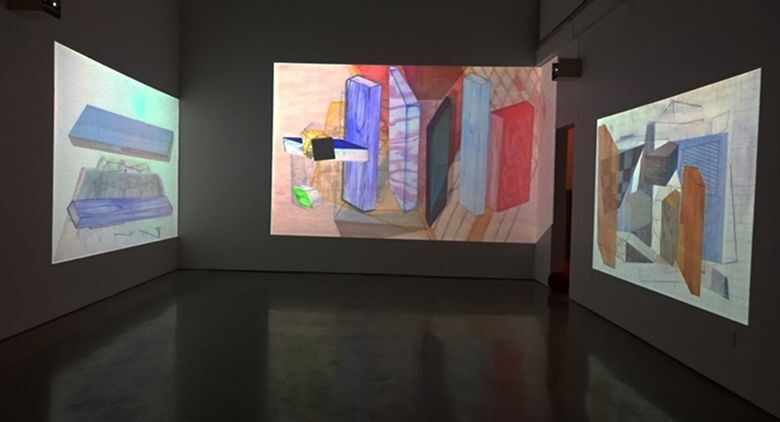 Robertson, who was already exploring structure in her large drawings and prints, began by creating a model of the gallery and building her digital animations. The resulting videos feature playfully patterned building-block-like shapes floating around, falling into place, then falling away again, as they continuously construct and deconstruct abstract structures. All of this is projected across the actual structure of the room, asking us to look back and forth between building and image and to think about our relationships with our environment and how we both receive and create experiences. Along the way, Robertson found connections to today’s construction boom and to the Russian Constructivist movement of one century ago. And she’s not done yet. In keeping with the process-oriented goals of the Oxbow, Robertson will add two more videos to her installation before her residency is over in January. So, now, she moves around the space with a projector, testing how her freshly made animations might look in a corner, across the stairs, or on the high ceiling. Gayle Clemans is an art historian, critic, and novelist. Connect with her on Instagram and Twitter @gayleclemans.